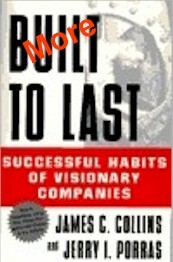 More Built to LastDue to the incredible success of our first book, we are working on our new book, More Built to Last. As we write this book, we are continuing to work with additional companies and determining visionary status. To give a sampling of the next set of companies, we will periodically be posting information from our research on this site. The first set of companies we have chosen to compare are two motorcycle manufacturers. As in the original book, they will be compared using the same criteria.